Anyway I spent today scrappy happy and doing laundry. I am returning to work tomorrow, that should be fun. :) I got three layouts completed today so that was quite the accomplishment. I am so happy that I have my sewing machine working now and can sew to my heart's content on my layouts too. First the Double Pager that I finished yesterday. 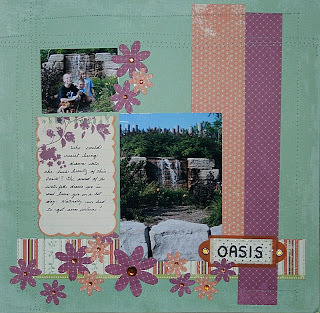 Here is my first layout that I did for a sketch challenge at Art Unleashed. 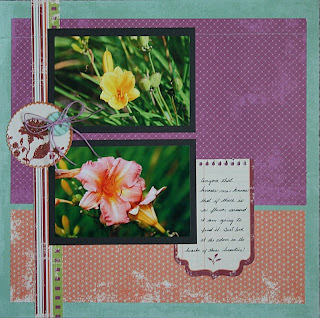 Art Unleashed is a new Scrapbooking forum started by a couple of ladies who want to push your creative side to its limits but they don't like drama. There isn't any store attached to the forum so you are free to talk about where you get your best buys etc.. it is also a Canadian site. Can you tell that I am in Luv with the MM Noteworthy products? Here is my third layout, I tore myself away from the Noteworthy for this one. 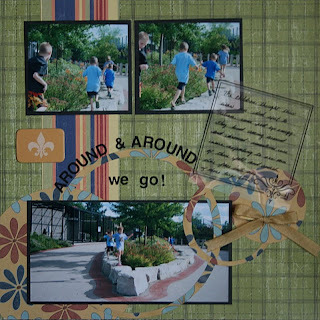 I used a sketch from "A Scrap Addict's sketches" for this Layout. 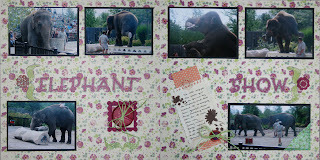 awesome los jackie..totally lovin those elephant pics..and gorgeous flowers..yummy! Jackie!!! What wonderful news!!! Love your LO's! Great stuff!!! Happy to read your eyes are coming along!! Great news about your eyes Jackie! !